From a young age, Byeong-soo channeled his murderous desires by mostly targeting bad people but he’s hasn’t killed in over a decade. Recently he’s begun to suffer from Alzheimer’s which has led him to start writing a diary of his life before he forgets. He lives with his daughter Eun-hee, but unbeknownst to her, she is actually the daughter of one of his victims. 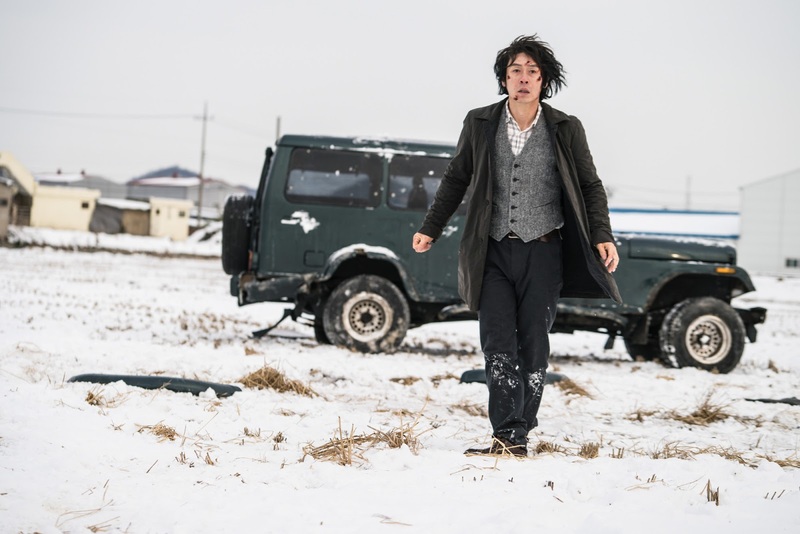 One snowy afternoon, Byeong-soo gets into a minor fender-bender with Tae-joo, who is clearly trying to hide something. 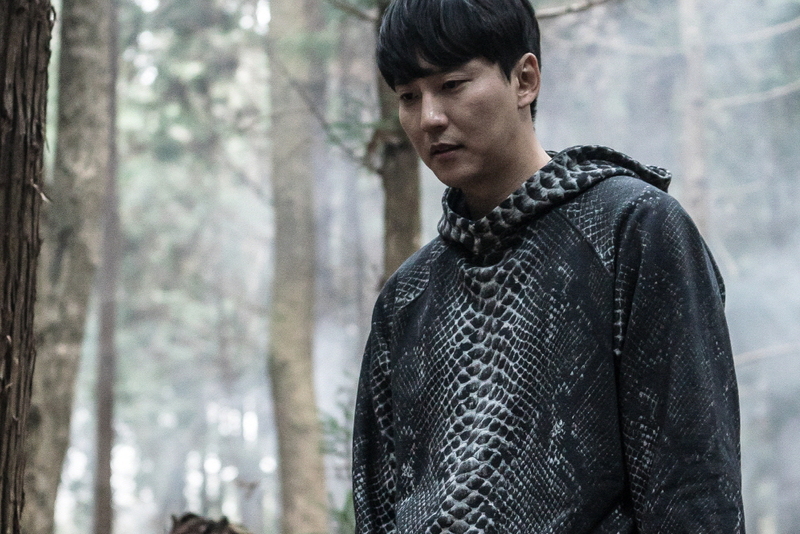 Byeong-soo can immediately sense that he’s come to face-to-face with another serial killer. Tae-joo, who works for the local police, is also suspicious of Byeong-soo and tracks down Eun-hee, who he begins to seduce. But when Byeong-soo sees them together, he can’t recognize Tae-joo. Though almost laughably contrived, the premise of Memoir of a Murderer is an intriguing one and the film gets off on the right foot with fast-paced storytelling framed with moody and menacing visuals. 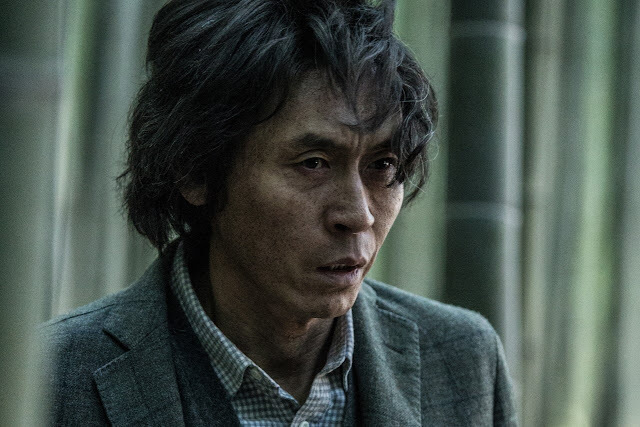 It helps to have someone of Sul Kyung-gu’s caliber draw us into the tale, even if his cuckoo demeanor and scraggly wig come off as artificial, though no more so than the story. The problem is that after setting several layers of intrigue in motion, the film proceeds to get tangled up in its own mystery, pushing its already strained credibility to breaking point. The film may not provide Sul with one of his best parts, and it brings to mind his many protective father roles in routine mainstream fare such as Voice of a Murderer, No Mercy and Troubleshooter, but between this and The Merciless earlier this year, it’s good to see him have fun with some slightly more novel characters, even if they remain strictly within the thriller mould. However, the script at times doesn’t do him any favors, such as with a terrible running gag about Byeong-soo’s delayed reaction to humor. Less convincing is Kim Nam-gil as the rival serial killer, who has neither the threatening grit nor creepy boyishness to make either side of his character land. As with his recent roles in Pandora and One Day, Kim delivers a competent but hollow performance. Forced to carry around a kitten or walk around in ‘I’m a serial killer’ clothing, he comes off a little the worse for wear here. Filling out the cast is an unremarkable Seol-hyun as Eun-hee and the ever reliable Oh Dal-su filling in with standard comic support as a local cop and old acquaintance of Byeong-soo’s. For fans of Korean thrillers, there’s a certain charm to Memoir of a Murderer as an exaggerated, almost comic book-like highlight reel of past glories in the genre, whether its the tunnel of Memories of Murder, the catch-and-release chase of I Saw the Devil or all the usual car crash and family trauma beats that often litter these stories. It might have had been more so if some of the superfluous characters and segments were cut off, such as a poetry class that acts as dead weight anytime we return to it, and if the twists that revolve around memory were surprising rather than convoluted, but buried under its manifold problems, the film does have its moments with occasionally shine through. Diverting yet frustrating, Memoir of a Murderer follows director Won’s other adequate thrillers, which include A Bloody Aria, Seven Days and The Suspect. The story of his latest strives for more, but the style remains the same - polished but lacking in panache. A few nice locations and snowy exteriors are mostly filmed with shot/reverse shots and the occasional slow zoom in. Ultimately, the same could be said of the story. Some promising story elements are tossed into the pot, only to be left to float around listlessly until they sink out of sight. Spot on! U encapsulated every one of my impressions after watching the movie last night. Excellent review.